The Baltimore Orioles open the 2018 season at Camden Yards March 29, which happens to be Holy Thursday. The conflict between entertainment and worship recalls the Orioles’ 2012 opener, which fell on Good Friday – and, before that, an era when “blue laws” restricted most business operations on Sunday. In the city, that meant Major League Baseball and National Football League games could not start before 2:05 p.m., which played a secondary role on another March 29, one that lives in Baltimore infamy. On the other side were department stores and other commercial enterprises, most notably the Baltimore Colts. Even with the 2:05 p.m. kickoff, worshippers at the former St. Bernard in Waverly and other churches in the vicinity of Memorial Stadium on 33rd Street knew that it was easier to walk rather than drive to later Masses on Sunday morning. 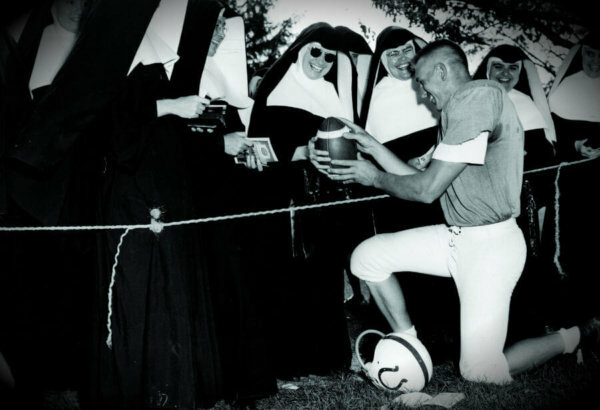 The success of John Unitas and the Colts spurred interest in the sport, which led to lucrative TV contracts and uniform kickoff times for nationally televised games, 1 p.m. and 4 p.m. The Colts’ late start time was among the laundry list of grievances owner Bob Irsay aired as the franchise endured six straight losing seasons from 1978 to 1983, and the departure of the good will that had peaked around Unitas and company in the 1960s. Baltimoreans awoke March 29, 1984, to the news that, under the cover of darkness, Irsay had relocated the team to Indianapolis. The Orioles moved the first pitch of Sunday games from 2:05 p.m. to 1:35 p.m. in 1988. This year, their Sunday home games will start at 1:05 p.m.
Read more ‘Our Back Pages’ here.